Born in Arles, on December 14th 1968. Stays in Japan: November 97, April 98, March 2000, October 2004, April 2008. Stays in Germany: October 2006, June 2011 and June 2013.
entrance hall, Shibuya city hall, Tokyo. September 2010: "Françoise Vadon", La Fabrique Sensible publishing house. This book includes a serie with 46 "interiors" painting on the same square size. 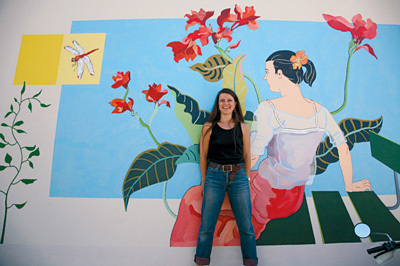 2006 - GRAVESON, 1st prize of "Pictural & Mural", within the framework of european project "Equal ID2", with "Les Chemins de Provence Prestige" partnership, work of a mural painting 7 meters long and 2.50 meters high, on the public school outside wall. I work particularly on the relationship between the body and the space around it. The simple and poignant beauty of everyday life things (referring to Japanese MONO NO AWARE) is an inexhaustible source of motifs and questioning. Each painting is both autonomous and connected with all the others. I have not an only viewpoint, I move a little according the parts I'm painting, I try to deconstruct the space. The result of this wrong perspective is a light confusion of the spectator vision. I don't work on light and shadows, but on the framing, the colours contrast, the lines and the forms. I don't look for realism or narration...I work simply and directly on painting trials. I paint on brown and grey paper, linen canvas (keeping its brown natural colour) or on thick cotton canvas. I use acrylic paint or I prepare my colours with pigments and acrylic binder. I work directly onto the paper without sketching. The picture develops little by little through the use of colour. In this way the painting evolves continuously (I don't have a distinct idea of the picture when I start it). For my last paintings I mainly work on little square formats. I paint also on big size floating canvas to "a life-size" work refering to medieval tapestries.